The second part of the series will analyse how consumers buy cars. Readers will find a lot of tips and tricks related to buying a car. Every person eventually has to deal with big purchases, such as those of cars. Without cars, it would be impossible to commute long distances and run many businesses. Learn how other consumers handle buying a car, and how can you do it in a way that saves both money and time. Car consumption trends differ radically between the continents. Some regions are experiencing declining growth rates, while others have seen nearly two-digit sales growth. Southeast Asia has been leading car sales in volume and growth. It is predicted that the used car market will increase in this region significantly in the coming years. This will happen because of the boom in sales of new cars in the Southeast Asian region. New cars will become used ones, and later on, will enter the used car market. European and North American sales data is not as exciting. The sales of used cars in USA are declining. European car sales statistics look better than USA’s, yet the numbers do not reach the level of Southeast Asia, or other fast-growing regions. Global car sales by fuel type (2017) Source: https://www.thoughtco.com/used-car-sales-figures-3308387. In North America and in Europe, people are more likely to buy a used car rather than new one. The European new car market was hit very hard by the economic crisis in 2008. Yet, new car sales in Europe managed to increase by an impressive 9% from April 2017 to April 2018. World’s most popular car brands. Source: https://visual.ly/community/infographic/transportation/worlds-most-popular-cars-country. In USA, car owners prefer bigger and more fuel-consuming cars such as the Ford. European car owners prefer more economic and smaller cars (Volkswagen and Renault). This difference can be explained by the larger size of USA and the lack of public transportation in it. These conditions create a demand for larger cars, which can hold more goods and drive longer distances without having to re-fuel. It’s interesting to compare different regions and the numbers of cars per household. Obviously, the more well-developed the car culture of a particular region is, the more cars a household will own. Yet, the differences between the numbers of cars per household in UK and Japan are minimal. 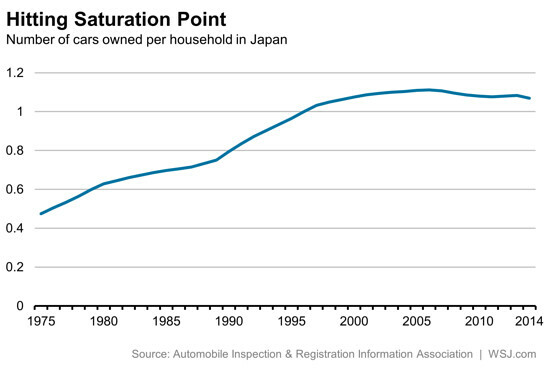 Number of cars per household in Japan from 1975 to 2014. Source: http://si.wsj.net/public/resources/images/BN-ED021_cars_G_20140815054253.jpg. The number of 1 car per household, Japan and UK achieved roughly at the same time – in 1996 and 1997, respectively. Number of cars per household in UK from 1997 to 2012. Source: https://bettertransport.org.uk/sites/default/files/CfBT_NTS_2012_new_data_FINAL.pdf. In USA, the numbers are bigger. The number of cars per household hovers somewhere around 1.76 cars. This number is almost 2 times bigger than the numbers of UK and Japan. Number of cars per household in USA from 2006 to 2013. Source: http://www.governing.com/topics/urban/gov-car-free-cities.html. Consumer preferences change as they age. Younger car buyers tend to buy more economical cars. The next age group, the generation X, prefers larger cars with more seats and lower fuel efficiency. The oldest age group prefers smaller cars. Car preferences by age group in UK. Source: https://www.click4reg.co.uk/images/blog/UK-car-study-636022769200396265.jpg. The statistics related to electric cars are mixed. In 2010, two thirds of the people surveyed (UK) answered that they would not like to buy an electric car. 31%, of respondents, however, answered that they would like to own an electric car. In 2016 UK government survey, only 5% of the surveyed said that they were considering buying an electric car or a van. The large differences in the survey results could be caused by different groups being surveyed. In the first survey, visitors of a car-related website were surveyed. In the second survey, the general UK population was surveyed. The demand for electric cars is so high, that famously, the Tesla factory has a hard time keeping up with it. Americans should try to buy smaller and more economic cars. A car like a Renault or a Volkswagen will use less fuel and will save a lot of costs related to petrol. Buying a used car is a great savings strategy. However, it will only work if the owner will be willing to examine the car extensively before purchasing it. Car buyers residing in regions with booming new car sales, should wait up to a year to buy a car. After around a year, many of the new cars will enter the used car market. A car driven for a year or two is still in prime condition. Buying a car driven for a year is almost like buying a new car. A difference is that it comes with a large discount. Thus, car buyers in the Southeast Asian region, where new car sales are growing every year, should look into the used car market for great savings. 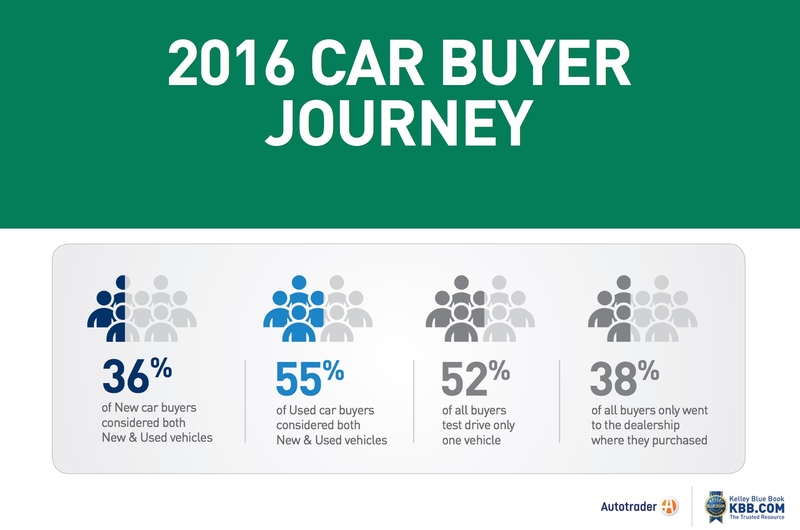 The used car market in this region, and regions showing same growth rates, is going to grow in the coming years. Car buyers in regions where car sales are declining should take advantage of the information they can access. Information freely available on the internet can be used to negotiate with car dealerships and their associates. A sales associate boasting about growing numbers in a declining sales region shouldn’t be believed. Knowing the data related to sales numbers can help car buyers relieve information asymmetry. Also, the knowledge helps to take advantage of the bargaining power they have. Learning how to share a car, rather than owning 2 or more cars per household, could help with car costs. USA car owners should think about owning fewer cars per household. European car owners should think about entirely substituting their cars for public transportation, as it’s cheaper than owning a car. Buying a car not according to your age trends can be a way to save money. Before purchasing a car, the buyer should examine their own opinions. Researching how other buyers of the same age group buy cars, could point to opinions being affected by age. The fast-growing electric car sales numbers suggest a rising demand for electric cars. This could lead to lower prices of electric cars. Hence, electric car buyers should not wait to buy a car, as the high demand will be lowering the prices of electric cars. Benefits of electric cars include cheaper fuel, smaller pollution output, and the ability to charge a car at home. In some areas, charging stations charge electric cars for free, thus lowering fuel costs to 0. Costs of electric cars include insurance, maintenance, and fuel costs. Owning an electric car is a money-savvy decision. That’s because fuel costs for electric cars are lower than fuel costs for petroleum-powered cars. Although it seems obvious, but people often forget to ask for a better price in car dealerships. This is one of the main factors that lowers the chances of saving money on a car. Because salesmen in dealerships have monthly sales goals, they are inclined to give discounts. They wouldn’t like to see a potential customer walk out, and lose a sale because of that. Buying a car in a dealership should be done at the end of the month. If a salesman hasn’t made enough sales, he or she will be likely to give a discount for a car. Receiving a discount isn’t a given, but the very least, the customer will receive free accessories or add-ons for a car. That’s certainly better than not receiving any free additions. Going to more than one dealership and test driving more than one car can be important. However, researching the technical qualities of cars trumps the input buyers get from test driving. Saving money on a car depends on the fuel a car uses and its fuel efficiency. Electric cars, like Tesla, although are equipped with high price tags, are powered by fuel that is much cheaper than oil. In oil-rich countries, however, driving a petroleum-powered car could help save money. For those living in colder areas, diesel-powered cars should be avoided. Diesel turns into gel in colder temperatures, and the car become unable to function. The region a car is made in, also plays a role in saving money. Because cars are made for different regions, one region may receive a car with certain qualities that may not be present in the same car made for another region. In Europe, this distinction separates the cars made for Western and Northern Europe and all other European regions. In Americas, this distinction separates the cars made for North and South America. Even more separation is present in cars made for different Asian countries. It’s important to research the differences between the models for differing regions, and choose the model that fits the individual buyer the best. Common car purchase traps can be hard to spot. Nevertheless, once a person knows about them, the methods of getting customers to spend more become clearly visible. The most common purchase trap of buying a car is buying a used car with hidden defects. Defects and problems pile up as a car ages. Most used car buyers know how important it is to check for hidden defects. However, many want to complete the purchase of a car as quickly as possible. This impedes their ability to search for defects and ask the seller the right questions. Sellers in USA also are not required to notify buyers about car recalls. Humans are biologically inclined to trust other people. This ability, which helps in other spheres of life, can lead the buyer to buying a damaged car. A solution to this problem: hiring a car mechanic to check out the car. An even easier solution is driving the car to a mechanic shop. Cars are liabilities, and large ones at that. They come with large yearly costs, and no one wants acquire additional costs. This can be avoided through a systematic examination of a car before the purchase is complete. A common purchase trap is salesmen jacking up prices for groups with little to no knowledge about cars. Many members of different social groups are not interested in cars. Salesmen take advantage of this fact, and jack up prices for the cars they sell. Salesmen also often provide dishonest information to people with little knowledge about cars. People with little to no knowledge related to cars, should buy a car with someone who knows about them. Many buyers also fall for the trap of “new and better” cars. Just because a car is new, it does not mean that it is fuel-efficient or high quality. Many older cars are better than newer ones. However, this is often forgotten because of the fallacy that newer is better. One forgotten benefit of older cars: information related to them. Thousands of forum posts and internet pages are dedicated to older car models and their problems. Newer car owners are often the first ones to deal with a specific problem. They may be forced to use the services of a pricey mechanic of a car dealership, rather than fixing the problem on their own. Since dedicated forums for older car models exist, car owners of older cars don’t have to worry about overpaying. Most likely, another owner has already dealt with a similar problem, and is ready to offer advice for free. This possibility is not always accessible to the owners of new car models. The best deal a car buyer is going to get depends on the region the buyer is buying a car from. Best deals on cars in USA are cheaper than best deals on cars in Europe. However, the best deals for electric cars are significantly better in Europe than in USA (because of government subsidies). With how much variety there is in brands and models, there is no one secret trick to saving money on a car. Knowing car buying trends and the most common purchase traps, however, will help any car buyer to save money on their purchases. If you like this post, please consider supporting Money Bear Club on Patreon: link.